for openings other than standard rectangular windows. 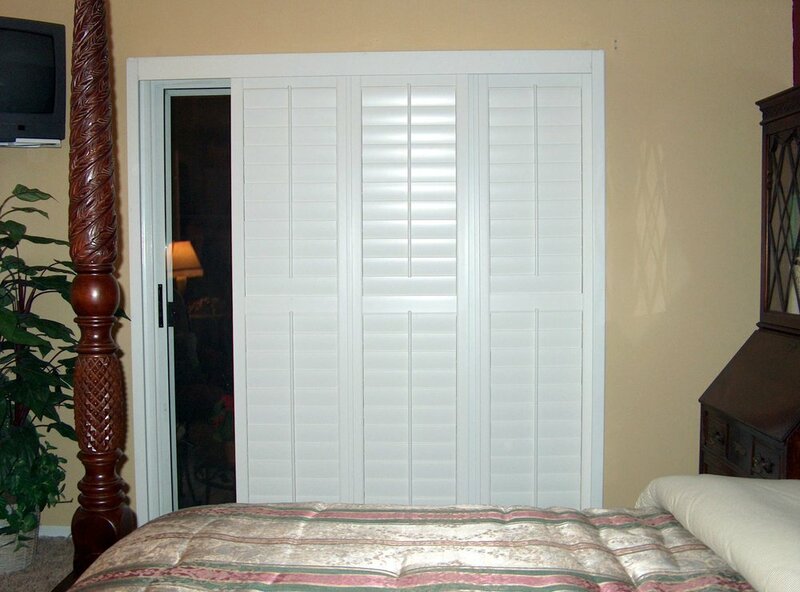 Sliding glass doors are some of the most common styles of windows for which we make and install plantation shutters. Typically, our design for your interior shutters in front of a sliding glass door will match the construction and operation of your existing glass doors. In other words, we will install your shutters on a sliding track system so that the shutter panels slide just like your doors do. For example, a standard 72" x 78" sliding glass door has two 36" panes of glass, with one or both able to slide to the other side of the opening from it's closed position. In order to mirror the window's construction, we will have two sliding units of shutters, one in front of the left pane of glass and one in front of the right pane of glass, that both have freedom of movement across the entire opening. When you want to access your glass and walk out onto your patio, you simply slide one sliding unit of shutters in front of the other unit and then operate your glass door like normal. Don't be alarmed if your sliding glass door has more panes of glass or is of a completely different construction. We've seen it all, and we'll be able to design a shutter for your sliding glass door that looks and functions in the most beautiful and efficient way possible. Arched panels are manufactured by extending the horizontal louver slats into the curved portion of the opening and curving the top of the shutter to match the curvature of your window. Arched panels are becoming more and more popular among our customers because they have a slightly more modern aesthetic when compared with the other option for making plantation shutters fit into a curved opening--sunbursts. Sunbursts, on the other hand, are the more traditional plantation shutter style for curved openings. Sunbursts are a fan-like style of plantation shutter that can sit on top of a rectangular shutter, or be installed on its own in a half circle window. As mentioned above, the sunburst style of shutter is a more traditional look on the plantation shutters, and although less popular than the the arched panel alternative, is no less beautiful and can be extremely appropriate in more traditional homes.